Hanoi (VNA) – Prime Minister Nguyen Xuan Phuc has lauded the might of the pen of writers and the paint brush of artists as well as their contributions to the nation’s achievements. He said that during the renovation period that had ushered in great socio-economic changes as well as artistic trends, the community of writers and artists had shown solidarity with the Party and the revolutionary cause. They had also contributed significantly to national development, he added. 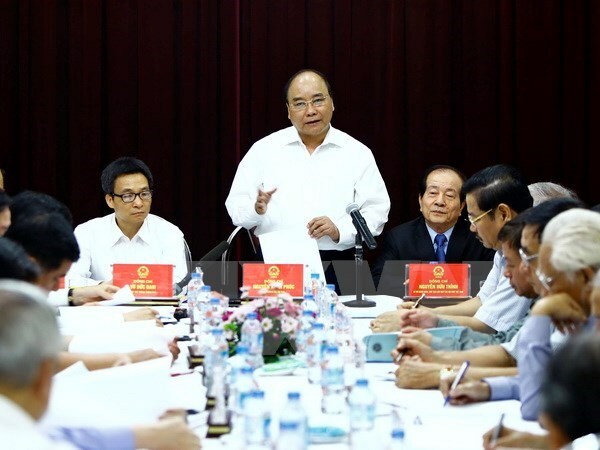 PM Phuc was speaking with the Vietnam Union of Literary and Art Associations for the first time in the capacity of the country’s Prime Minister in a meeting held in Hanoi on August 4. The union, established in 1943, operates under the leadership of the Party and the management of the Government. It represents 40,000 artists and 74 member art associations throughout the country. “Uncle Ho considered artists and writers to be as powerful as an army, helping build the soul and character of the Vietnamese people,” the PM said. Union officials told the PM that in recent years, artistic works have progressed well, both in terms of quantity and quality. Many works showed profound depth, they said. On behalf of the union’s member associations, Chairman Huu Thinh presented a “9 requests” petition to the PM aimed at alleviating difficulties and hardships for artists nationwide. One of the pressing concerns raised at the meeting was State support for traditional arts that are losing ground against contemporary art forms. Financial support and access to social housing for struggling artists (in the form of an artist’s village) were also included in the requests. Union members also asked the Government leader for provision of an annual working capital instead of having artists going around seeking funds. The proposal was accepted by the PM who said an annual fund of 90 billion VND (3.96 million USD) will be made available. Stressing the union’s role as a political, social, and vocational organisation, the PM suggested that it improves links between member associations and handle financial matters better. He urged the promotion of young talents and the ties between different generations of artists.